For those of you who like your slots as basic as they can possibly get, Party Line from Playtech will answer all your prayers. There’s no bonus rounds, no features, no cut scenes, no fancy animations, and ultimately no character. It’s got one single win line that you can stake between one and three coins on but the only way to win the enhanced jackpot is by using the maximum. It’s difficult to find anything to like about this machine. It’s garish and basic at the same time, and playing it is a dull experience. I guess it’s a nod to the old days of fruit machines but it doesn’t take long playing this dated offering to realise that evolution is a good thing. The top jackpot isn’t too shabby though. Party hat = 4000x the coin value. Saxophone = 1,500x the coin value. Piano keys = 750x the coin value. Music system = 300x the coin value. 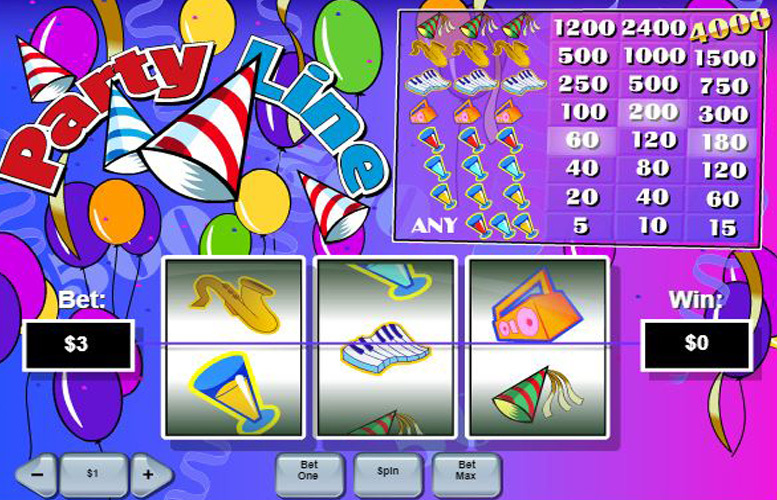 The Party Line slot does feature some horrific colour scheming, and an offensive soundtrack but it does not feature any features. The regular value symbols of the game are represented by brilliantly coloured, toxic looking beverages. Again, the following prizes are based on hitting three-of-a-kind, when wagering three coins per spin. All red drinks = 180x the coin value. All blue drinks = 120x the coin value. All yellow drinks = 60x the coin value. A combination of any coloured drinks = 15x the coin value. As with every other facet of Party Line, the betting limits are basic. Players can vary the number of coins bet on the single win line, and the value of that coin. The values range from 1p up to £5. This means you can play the game for as little as 1p, and as much as £15. Whatever stakes you chose, make sure you’re playing three coins per spin on this one. That’s the only way to glean any excitement from it, by hitting the enhanced jackpot for three party hats. I think you can gather, I didn’t enjoy this game much. I can’t imagine many folk disagreeing with me either. Machines like this get very old very quickly in real-life but online, when you can play some Marvel superhero slot machine with cinematic effects, and great bonus features? Even if that’s not really your thing, there are still a myriad of simpler machines that offer plenty more enjoyment than Party Line. It’s almost like a proof of concept from about 1993 when pitching the very idea of an online casino. If you think it’s a good game, I salute you. You clearly find beauty in things I never could but if I ever see that sickly blurple background again, it’ll be far too soon. This game has a rating of 1 / 5 with 224 total reviews by the users.